On a sub-orbital flight from New York to London, commercial spaceship The Spindrift crash-lands on a remote planet similar to Earth, except for the fact the inhabitants and plant life are twelve times larger. The heroes on board must do all they can to fight the totalitarian government that rules the planet and ultimately find a way to return home. From the unchallenged master of 1960s small screen sci-fi, Irwin Allen (LOST IN SPACE, VOYAGE TO THE BOTTOM OF THE SEA, THE TIME TUNNEL, THE POSEIDON ADVENTURE and THE TOWERING INFERNO) presents his boldest and most expensive show, LAND OF THE GIANTS. Premiering in 1968, Giants has built up a devoted fan base over the past four decades, thanks to its heady mix of mind-blowing pre-CGI special effects, suspense and terror laded plots with a solid dose of pure escapism. 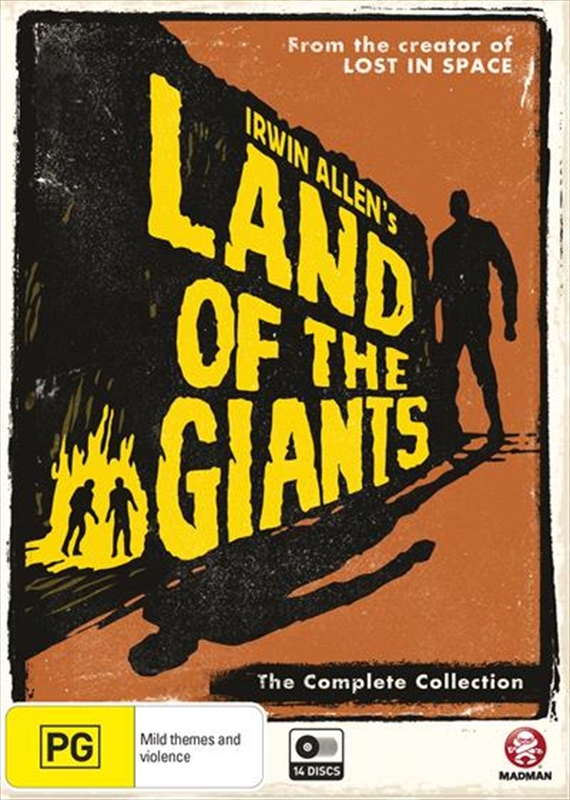 This special over-sized 14 disc set includes the complete series collected together for the first time - all 51 remastered episodes of LAND OF THE GIANTS in their original production order with a HUGE collection of special features. Look out above!